This is the unique manuscript of the 'Chronicles Of The Kings Of Man And The Isles', also known as 'The Manx Chronicle'. The original scribe wrote the text from the reign of Canute, in 1016, to the dedication of the Cistercian abbey at Rushen, on the Isle of Man, in 1257, and he also included a list of popes which ends with Pope Urban IV (1261-4). Following the chronicles are other texts relating to the abbey at Rushen. It is therefore probable that the manuscript was written for the new abbey a few years after it was founded. 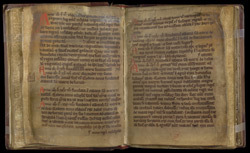 The entries on these pages relate mainly to events on the Isle of Man and the foundation of Cistercian abbeys: in 1102 Olaf, son of Godred Crovan, began ruling the Isles; Savigny was founded in 1112, Furness in 1124, Rievaulx in 1132, Caldra in 1134, and so on. Also in 1134, 'King Olaf granted to Ivo, abbot of Furness, part of his land in Man to establish an abbey in a place which is called Rushen'.